After last week’s DVLA fail I returned this lunchtime, cautiously pessimistic that something else would be wrong. On Friday I had received Section 10 of the V5, kindly returned by the new owner very quickly using recorded delivery. Arriving at the DVLA at 12:23 there was a warm stuffy room full of people and a 25 minute wait… As I had a numbered ticket, I decided to go for a wander to a scenic viewing point that overlooks the river Severn and some sites of the battle of Worcester. I got back to the DVLA about a minute before my ticket was called (probably to the annoyance of others sat there), and a helpful member of staff sorted everything out. The new keeper should get a V5 and MOT by the 28th April, and I should get the numberplate retention form a couple of weeks after that. Prepare yourself for one of my dullest posts yet (that’s quite a claim). I haven’t had to deal with the DVLA for a few years, but today hasn’t been successful. Given my buyer’s rapid timescale as his 9-5 Aero sold quickly, I wasn’t sure what could be done about the numberplate transfer, so first thing on Saturday morning I called the DVLA. The very helpful lady told me that I could sell the car as normal, and with the V317 registration retention form enter the buyer as the registered keeper, granting the numberplate to me for retention. That was good, so we went ahead with the sale last night. But then while finishing he paperwork following the sale I noticed that the V5 was supposed to be sent to Swansea, but the V317 could only go to my local DVLA office (but with a cheque payable to DVLA Swansea). I decided the best thing to do was to take all the completed forms and cheque to my local DVLA office in Worcester. You take a ticket to be served when you enter, and there was a bit of a wait, about 15 mins despite the screen saying 7 mins at the start and going as high as 10 mins. But then the DVLA lady tells me that she needs the complete V5, and this is only a partial V5. I am a bit confused, as the other removable side just had some instructions for completion and sections for sale to motor trade, export, and the slip for the new owner. Hence I had removed them when giving the new owner his slip. I couldn’t see any of them being of use. It turns out that I need the new owner slip, otherwise it isn’t a complete form. It would have been nice if that had been mentioned, rather than me being told that I could sell the car as normal. Apparently I should have read the instructions… I did very carefully., there are quite a lot of them. Apparently I should have transferred the registration before selling – that was my original plan, but then the DVLA lady had told me I could both at the same time. So, one drive to Worcester wasted, I have to go again. What’s more, I need to get section 10 of the V5 back from 100 miles away with the new owner. Grand. Luckily he is an understanding chap and, following a quick phone call, was very helpful and intends to send it ASAP recorded delivery. So I might stand a chance of finishing the transfer on Friday or Monday. 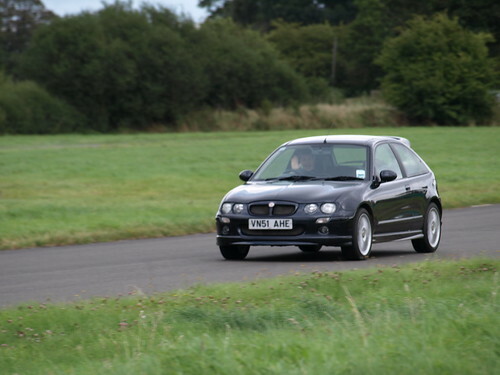 But not the slow sort of Sunday drive while wearing a hat and driving a Rover 400. A good blast across country and M50 to a very long lunch before repeating the journey back. Car started and drove fine, the increased wind noise and exhaust note compared to the Mondeo is noticeable, but none of that nasty diesel clatter. The car ran well, with plenty of boost available. Brakes still have some vibration when used hard, but are working well. Driving back, the dipped-beam headlights don’t have a very good pattern. I am not sure if there is some degredation of the reflective surfaces or they are pointed too far down. Full beam was fine. It might be worth changing to different bulbs and seeing if that improves things. But given I probably won’t drive the car for another few weeks, unless I go to watch the UK Saabs dyno day in Tewkesbury in a couple of weeks time. No motivation to dyno the car at the moment, but would be interesting to see some other Saabs. Got the Aero out of the garage yesterday (it only comes out once every ~ 3 weeks for a good blast), and let a mate drive it down to another friends house about 90 mins away. Before we went to The Boot Inn. for a hearty meal. What is worse is that we can use our own car for journeys of less that 150 miles, but if it is further, have to use hire car. Journey of < 150 miles, use 290 bhp Saab that cruises beautifully and eats up the miles. Enjoy the drive. Journey of > 150 miles, use 90 bhp Corsa that is noisy, slow, and tiring. Get to meetings feeling unhappy. Was great to be back in the Saab. With the Stg3, and running well, it really gains speed quickly regardless of going up steep hills, my mate doing the driving on the way down seemed content with the performance. Some time in, when he booted it in 3rd gear, I noticed what sounded like a slight rev rise before it caught again and carried on smooth acceleration. When I drove it back, we had that a few times under full load, but it was only marginal, and it always caught the revs rise 1/2 second later. I then thought that I remembered hearing that before occasionally as full boost kicked in. Air temps were ~ 7C, car was cruising so interooler was cold, and the boost was as high as I have ever seen it, a lot of space between the end of the red and the needle. I think the rev rise/slip is something I have seen before. Don’t normally get it on track because then I don’t use the revs where peak Stg3 torque is (stay higher), and it’s normally summer so outside temps are up, and over a few laps the stock intercooler gets warm so boost is normally lower. 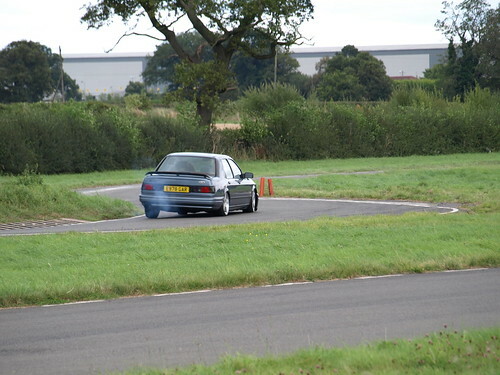 From rolling road a few years back (car should be better now as DI isn’t old, plugs are new and fuel is still V-Power) it kicked out a peak torque of 427nm / 314 ft-lb at the wheels. If one plucks a flywheel loss figure of 10-15% out of the air you could be looking at flywheel torque of 350 – 370 ft-lb. This is a lot. The Stg3 has an aggressive map, with > 1.4 bar boost at peak, but then it tapers as turbo/injectors can’t keep up. The clutch has been on for 40k miles, and I am an IAM type driver who very rarely holds the car on the clutch, so I don’t think it is wearing out, just can’t quite hold the peak power. Any opinions? 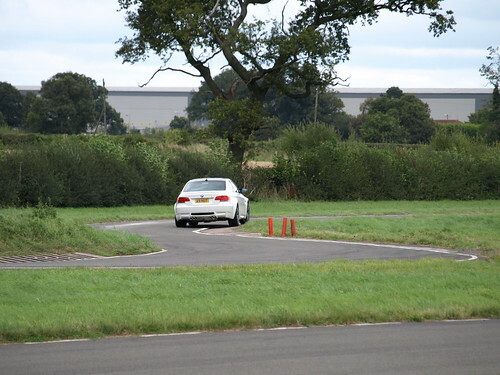 Having become involved in motorsport timing via a colleague, I had timed a couple of events at the Curborough sprint track near Litchfield. This is an interesting motorsport venue, used regularly for sprints and car testing. 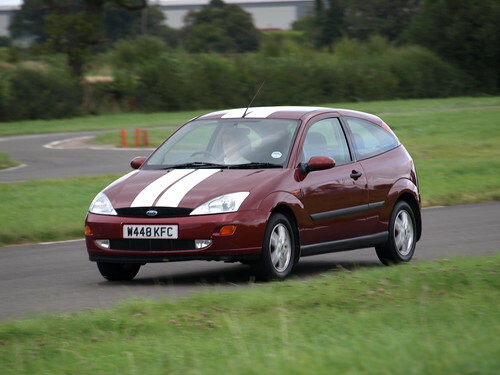 A short twisty piece of track, used by everything from unmodified small-engined road cars to powerful single seaters, and everything in-between. 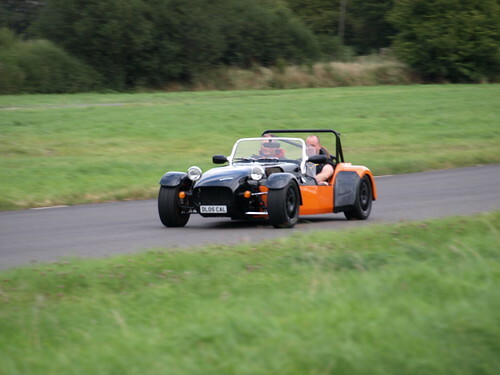 The members’ day is an opportunity for club members to do a few laps of the track in any road legal car. No need to wear a helmet. It is one car at a time, and due to that and the numbers you don’t get many laps, but the cost is low (just joining the club is much less than a trackday). 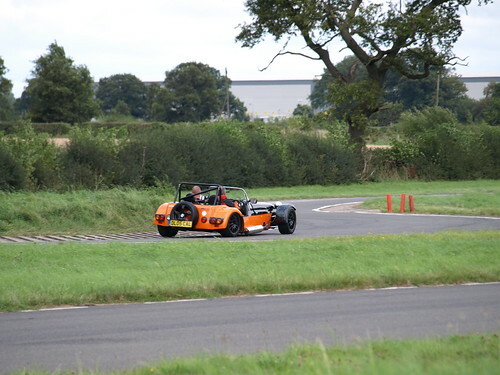 I was happy to only due a few laps, as the car had only recently come back from getting a new head gasket. 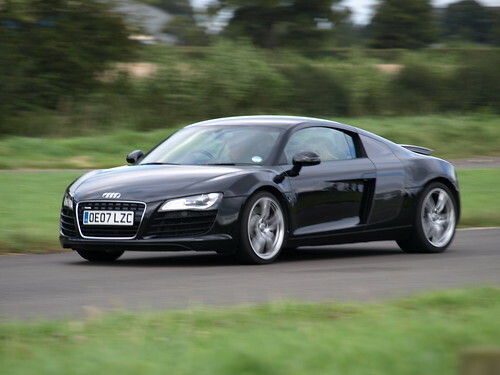 Joining the queue, and heading out on the track made me realise just how tight and twisty it was, with little run-off. 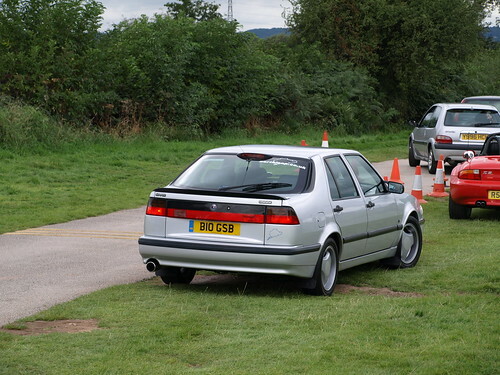 The Saab wasn’t the ideal machine for the track, barely hitting 80 down the main straight as it struggled to carry speed through the tight corners. No photos of me on track as the photographer was busy moving cars, or in cars, but it was the usual story of some straight-line speed and lots of roll. Still judder from the brakes when warm, not sure what is going on there. They hang on well, but it isn’t very smooth. Could be deposits on the disks, I have been very very careful about not doing anything that could cause warping. 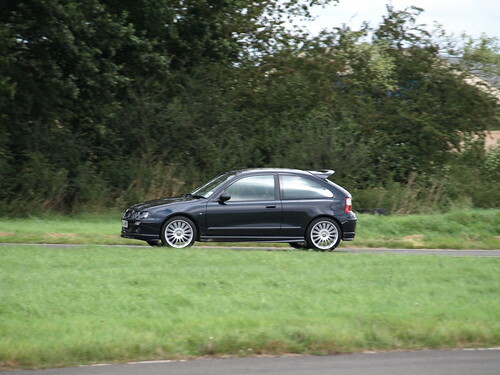 Had a couple of rides in my colleagues MG ZR. While this car has ~ 37% of the Saab’s power, it is lighter, and has far better handling for a circuit like this. With the lack of big straights, brute power doesn’t help, and agility is far more useful. He drove it very tidily, unlike my random lines on a new track. Hopefully he will be entering the ZR in some sprints next year in the < 1.4 litre roadgoing unmodified class, where it should be a competitive car. Spotting a nice looking Westfield, I asked the owner if I could have a passenger ride. He was very accomodating, and we had a good chat about the car before and after. The passenger laps were great, very very quick (225 bhp), loads of grip (888s, good suspension), and some much higher speeds than I could manage. Plenty of normal cars on the track, making little noise, and also some faster machinery. It’sd a fun day, little pressure, only a few laps, but a good time for track novices (like my fiance who had a go in the Saab) to get a little experience. Nice group of people there to chat about cars to. I travelled up to Birmingham on the train to collect the now fully functional Saab. 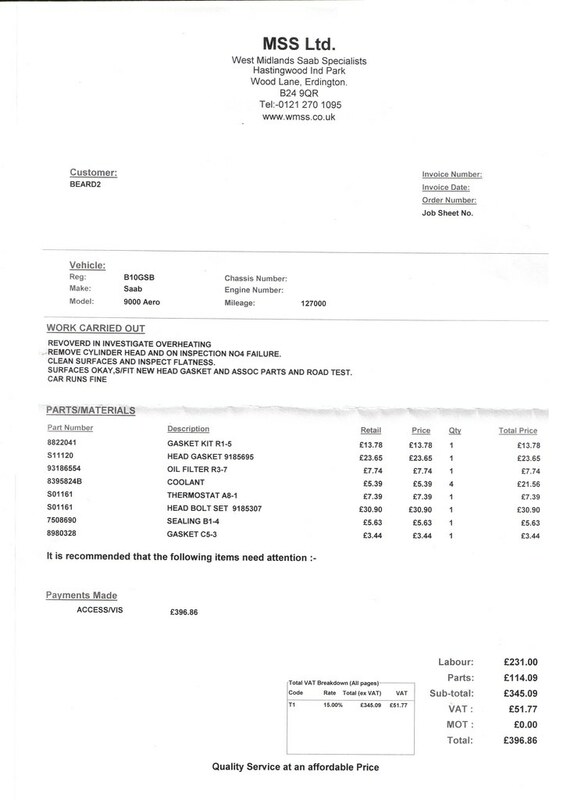 Â£396.86 for the headgasket, all the work, new thermostat and a few other bits and pieces such as an oil and filter change. Chatted with Paul at WMSS about his track car and what I should do with mine. No matter what I do it will never be worth more than Â£1000, and the suspension work I want will cost that much. Any comments on whether I should adapt the car for trackdays and at some point strip weight out, are welcome, or you can convince me to spend money I don’t yet have on an E46 M3. Just spoke to WMSS, the car is ready, has been road tested, and all is fine. The corner of the radiator where a few drops were spotted seems to be ok now the car isn’t over-pressuring massively, but if I do notice any future coolant issues, I’ll remember to check there. Cost appears to be Â£396, and seems to include a fair bit of stuff including new head bolts, various gaskets, thermostat etc. I’ll post more when I get the full breakdown, but it’s a price I can cope with. Collection will be on Friday, so I’ll post more info when I get the car back. Just spoke to Paul at WMSS. John has been working on the car, the head is off, and being cleaned up. It seems the head gasket had gone, but there appears to be no further damage. The head is flat, and there is no pitting. They are therefore replacing the head gasket and thermostat, and doing an oil and filter chainge too. Hopefully this won’t be ruinously expensive. I am glad no further damage was done in the overheating incident.